In the ‘70s, Roberto Polito, founder and president of the company, was sent to the Tuscan coast to develop a large resort for a Swiss operator. It was love at first sight when he discovered that still relatively unknown part of the Tyrrhenian coastline. In 1974, in Punta Ala, the initial step was taken with the opening of Hotel Cala del Porto, the first Baglioni Hotel. It became a family project, and together with his wife Lisa, and later with their children as well, he built up a collection of boutique hotels that is widely recognized as the epitome of Italian hospitality. Baglioni Hotels is about to land in the Maldives with the opening of Baglioni Resort Maldives. Located on the island of Maagau, in the Dhaalu Atoll, this exclusive resort of 96 villas surrounded by turquoise water, velvet white sand and the tropical nature of one of the most spectacular Maldivian islands, will allow guests to experience a bespoke stay in the heart of the Indian Ocean with the unique italian hospitality of Baglioni Hotels. 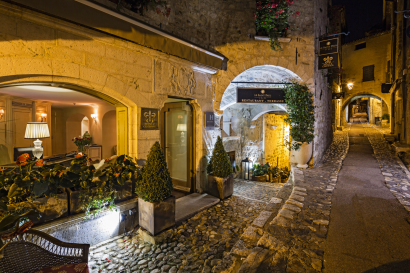 The first stone of Le Saint Paul was laid in 1511, long before the birth of Saint-Paul-de-Vence village. Prior to be a private noble’s residence, this edifice was used as a hospital, a church and even a location for secret organizations. 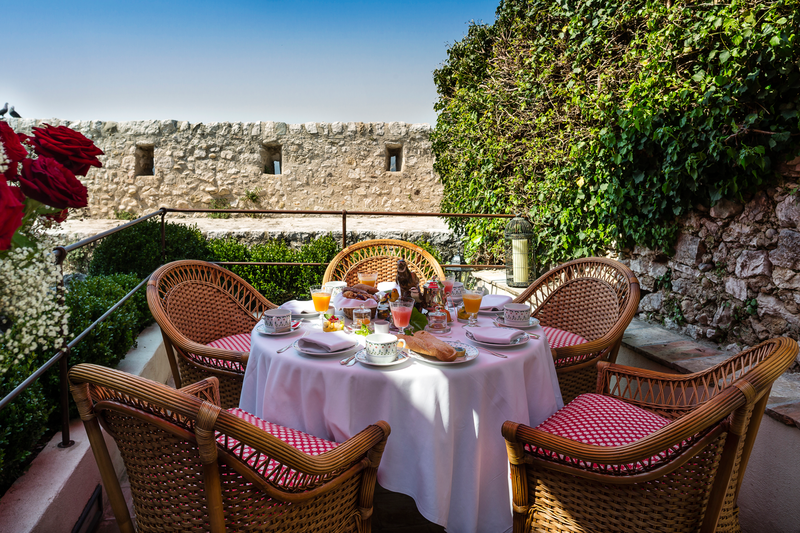 In 1989, important restructuring works are undergone, it became the first luxury hotel located in the heart of the fortifications and a few years later joins prestigious “Relais & Châteaux” affiliation. 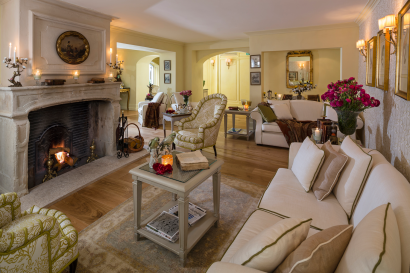 In 2004 Mr. & Mrs. Roberto Polito fall in love with Le Saint Paul unicity and transformed this house in a true jewel. Tucked within the ramparts of Saint-Paul-de-Vence, the renowned Le Saint Paul is a gem of discretion and serenity in the midst of its bustling surroundings. A stay here is an opportunity to fully appreciate the true art of hospitality, refinement and total relaxation. 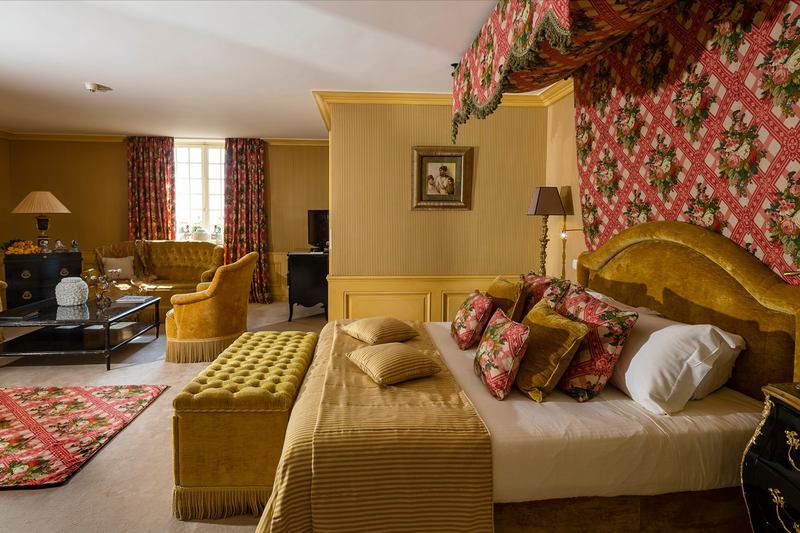 With their breath-taking views from this medieval perch, which take in the surrounding countryside and the Riviera coastline, the 16 luxury bedrooms are the epitome of living history and ultimate comfort. 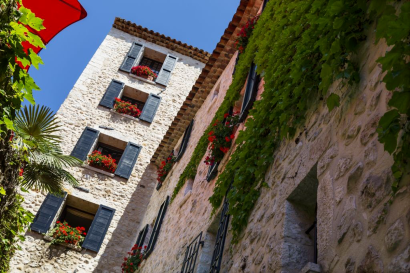 Hidden in the hills of Provence, Le Saint Paul stands in the very center of the Medieval village of Saint-Paul-de-Vence, the most beloved place of Chagall, Matisse and Picasso. 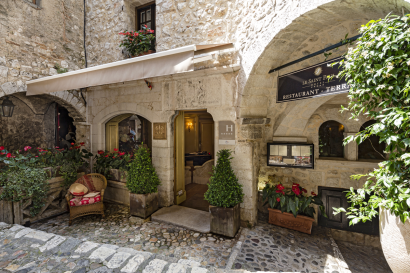 A stone’s throw from Nice and Cannes, Saint-Paul-de-Vence is the perfect location for visiting Côte d’Azur and a hinterland offering a host of surprises. On request is it possible to organize original and varied excursions to the French Riviera, the Bay of Cannes, and the Saint-Tropez Peninsula. Saint-Paul-de-Vence is home to many art galleries. Throughout the village, discover the works of countless painters, sculptors and potters. Dive yourself in the village’s unique atmosphere and follow the Marc Chagall Trail. Do not miss a visit to the Maeght Foundation, located just a few minutes from Le Saint Paul. A stay at Saint-Paul-de-Vence offers the opportunity to live unforgettable experiences like an helicopter tour over the Côte d’Azur and a cross in the countryside in race car or to live local experiences like playing « Pétanque ». Several amusement parks for children nearby. 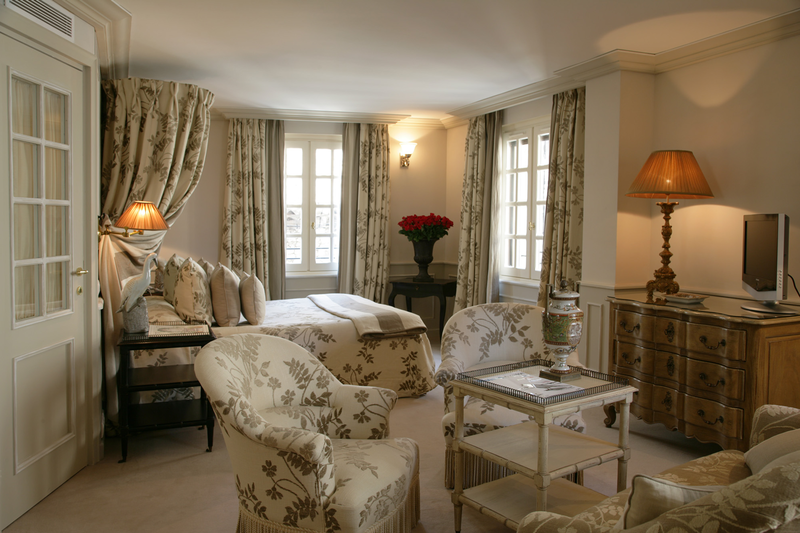 • 3 Elegance Rooms: overlooking the lovely listed pedestrian village streets. Bathroom with bathtub, toilets, hairdryer. 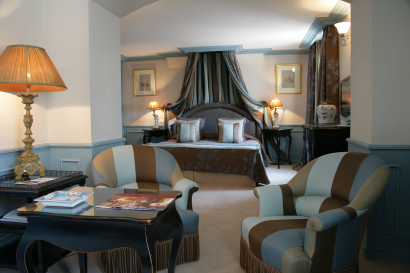 TV, Minibar, Telephone, free wifi, coffee facilities, air conditioning, safety box. • 5 Junior Suites Village: overlooking the lovely listed pedestrian village streets. Lounge area overlooking the bedroom. Bathroom with bathtub and/or shower, toilets, hairdryer. TV, Minibar, Telephone, free wifi, coffee facilities, air conditioning, safety box. 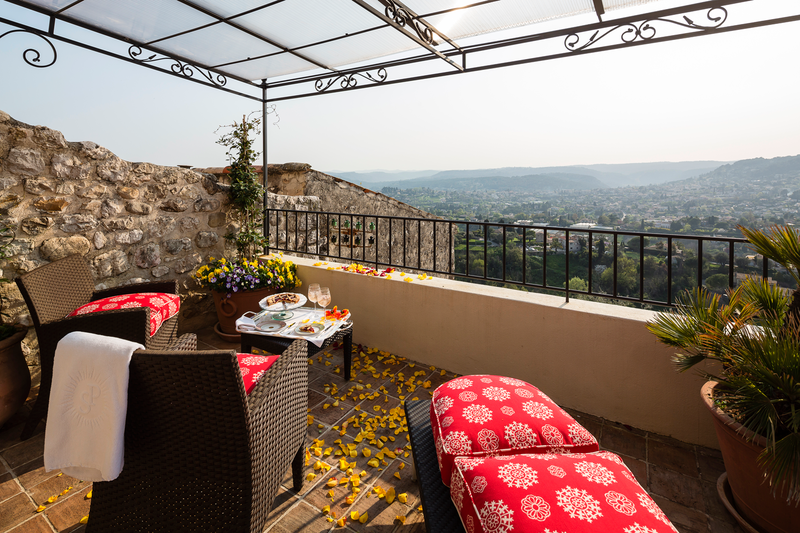 • 5 Junior Suites Valley: overlooking the lovely valley of La Colle Sur Loup. 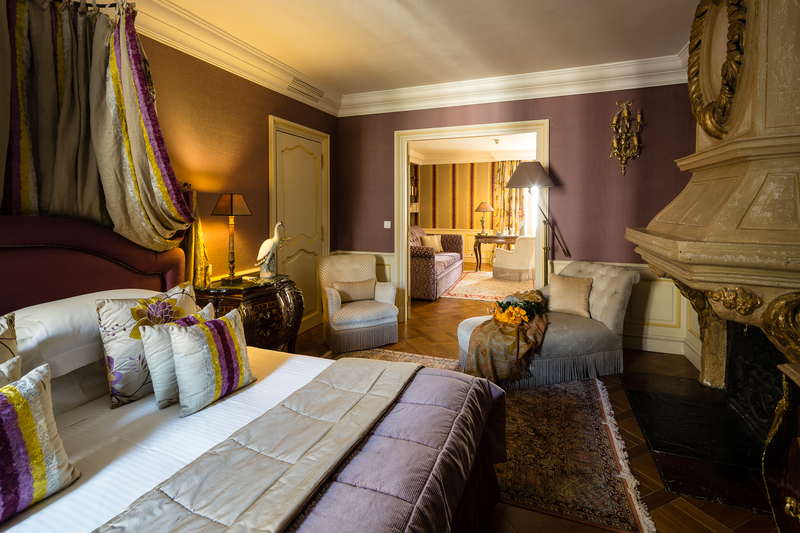 Lounge area overlooking the bedroom. Bathroom with bathtub and/or shower, toilets, hairdryer. TV, Minibar, Telephone, free wifi, coffee facilities, air conditioning, safety box. • 3 Suites: overlooking the lovely valley of La Colle Sur Loup or the lovely listed pedestrian village streets. Lounge area overlooking the bedroom. Bathroom with bathtub and/or shower, toilets, hairdryer. TV, Minibar, Telephone, free wifi, coffee facilities, air conditioning, safety box. 2 suites have private terrace and/or separation between bedroom and lounge area. A reference within the village, the restaurant strives to attain the highest gastronomically standards. 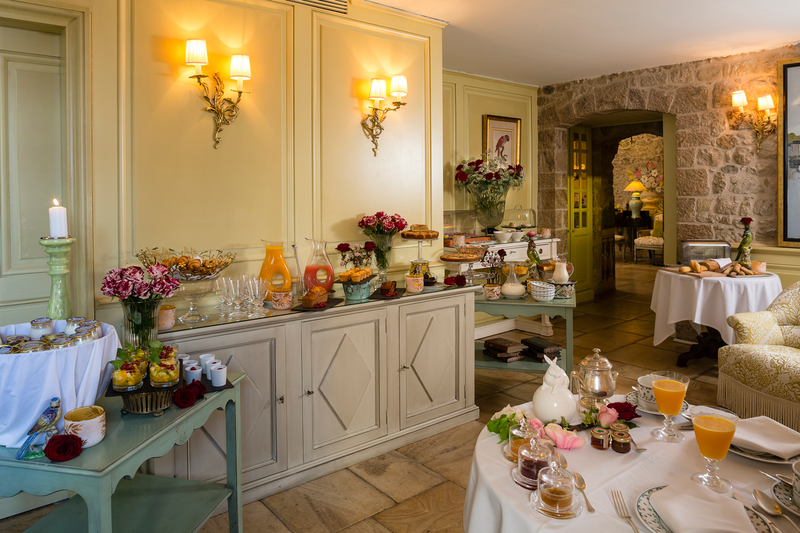 In the off-peak season, the thirty five place settings are laid out under the magnificent vaulted stone ceiling of the dining room, with its trompe-l’oeil frescos and bubbling fountain. 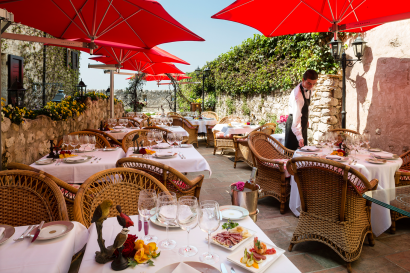 During spring and summer the restaurant spreads on to the flower-decked terrace, in the heart of the ramparts. Massages proposed in guest rooms.